Assuming you’re not from Nebraska, you might be amazed to know that Omaha is actually a fun place to live and visit. There are a plethora of things to do, places to visit and attractions to see. Omaha is fast becoming one of the most vibrant cities in America. Here are a few must stops the next time you are in our great city. Probably the most suggested and recognized “thing to do” in Omaha, the Henry Doorly Zoo, is a real treat. Located at 3701 South 10th Street, it is in the old south part of town and used to sit right next to the old Rosenblatt Stadium. You will find plenty to do in see at this world renowned zoo. Just a few years ago, TripAdvisor named this zoo the “world’s best zoo” beating out the San Diego Zoo. The zoo has so much more to offer than just the animals, which there is an abundance and quite the variety. They also have an aquarium which is well-known for its research in the conservation of animals; the largest cat complex in North America; the world’s largest indoor swamp and nocturnal exhibits; the largest indoor rainforest; and a place called the “Desert Dome”, which is the world’s largest indoor deserts. If you are looking for a whole neighborhood of fun, look no further than the Old Market, located right in the heart of downtown Omaha from South 10th Street, to Farnam and Jackson. There is plenty to do here to keep everyone in the family occupied for quite some time. You’ll find everything from restaurants and bars, to craft stores, art galleries, food trucks and a plethora of shopping options. Walking in the Old Market you will see and feel the charm of old school Omaha from the early 1900’s. Much of downtown still has its brick laden roads and you’ll often find horse drawn carriages, street performers and art exhibits on them. If you have kids, there are 2 recommendations; Omaha’s Children Museum and Fun-Plex Waterpark & Rides. The latter being much more advised in the summer time of course. Fun-Plex Waterpark & Rides is located just off of 70th & Q in Omaha and is the largest amusement park in the state. In fact, it holds the only roller coaster anywhere in Nebraska! Aside from the roller coaster, you will find a slick track for go carts, bumper boats, waterpark with a wave pool, water slides as tall as 5 stories, lazy river, children’s pool, kiddie coaster, Ferris wheel, miniature golf and a lot lot more! The other perfect activity for the kids, good for all seasons, is the Omaha Children’s Museum located at 500 South 20th Street. This museum has received nationally and world accredited awards for science and technology. The new and featured exhibit, “Building on the Best”, features a theater and studio amongst a plethora of other science and technology tools and toys the kids can play with. You’ll often find live science shows and demonstrations taking place. That’s right. Omaha is well-known for all kinds of things, but I’ll bet you didn’t know it houses the world’s largest ball of stamps! This unknown gem can be found in Boys Town, somewhat near Bulldog Home Inspection on the west side of the city, in Omaha off of Flanagan Blvd. The ball is made from an estimated 4.6 million canceled stamps! Licked and put together, stamp by stamp, from the Boys Town Stamp Collecting Club which was established in 1953. Don’t just visit Boys Town to see stamp ball only. The facility is over 900 acres and has its own philatelic museum. Looking for something to do outside of the hustle and bustle of city life in Omaha? Chalco Hills Recreation Area off of South 154th Street in the very southwest corner of the city will offer you a very pleasant outdoors recreational experience. Visiting Chalco Hills you will find Wehrspann Lake. This lake is manmade and takes up about 246 acres of the 1,186 park. You will find picnic areas, walking trails, soccer and baseball fields, and plenty of playgrounds. Depending on what season you are visiting, you may find hot-air balloons launching in the summer, cross country events in the fall, and a vast amount of ice fishers in the winter. There truly is plenty of things to do in Omaha. 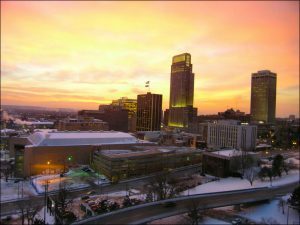 Whether you are staying for a day, a week, a month or planning on making Omaha your new home, you will certainly find many things to do in every season, warm or cold. Omaha is growing, too! The city is vibrant and growing and adding many new restaurants and bars for the nightlife seekers, golf courses for the golfers, and new shopping malls and districts for those shoppers in the family. Spread the word. Omaha is affordable and fun for everyone.